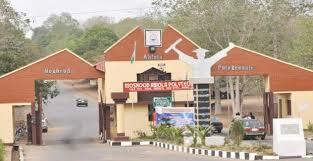 Confusion spread through Moshood Abiola Polytechnic, Abeokuta on Monday as lecturers reportedly shunned the scheduled second semester examination billed to start that morning. The boycott of the examination followed the subsisting face-off between the Ogun State Government and members of the Academic Staff Union of Polytechnics, MAPOLY chapter, over the conversion of the polytechnic to Moshood Abiola University of Science and Technology, Abeokuta, and establishment of the Ogun State Polytechnic, Ipokia. The students who had come prepared to sit for the examination were stranded in their different centres, as there was no one to address them on the new development. Members of the ASUP were, however, seen gathering for an emergency congress at the Union House within the polytechnic premises. None of the union leaders was ready to disclose the outcome of the congress which lasted for about two hours but a member of the union who spoke in confidence with our correspondent said the congress had declared a ‘work-to-rule’. The Chairman of the Union, Kola Abiola, who was later monitored on a television programme, alleged that the lecturers of the institution had become an endangered species over the conversion of MAPOLY to a university. He argued that the state government did not include any member of the union in the technical committee, and the union was also not consulted by the same committee. He explained that while the new university had been recognised by the National Universities Commission, the staff were yet to know the status of the new Polytechnic (Ogun State Polytechnic). He lamented that while the new Polytechnic had yet to be recognised by the National Board for Technical Education, courses were also yet to be accredited. With all these outstanding issues, Abiola noted, the government was bent on moving the lecturers to the new polytechnic. He said, “If you look at the website of NUC, you will see Moshood Abiola University of Science and Technology that has been recognised. What’s is the status of Ogun State Polytechnic with National Board for Technical Education? “This is a question we are constantly asking the Ogun State government and the technical committee. If I am going to Ipokia and accreditation has not been secured for Ipokia, what happens to my fate? Abiola explained that three different letters had been written to the state Commissioner of Education, Modupe Mujota, while another one was written to the governor through her office. He, however, said that none of the letters, including one which was published in a daily newspaper, was acknowledged by the government. Efforts to speak with the Public Relations Officer of the institution, Sulaiman Adebiyi, proved abortive, as calls made to his mobile telephone did not connect while he did not reply to the text message sent to him on the issue.